Hey there! 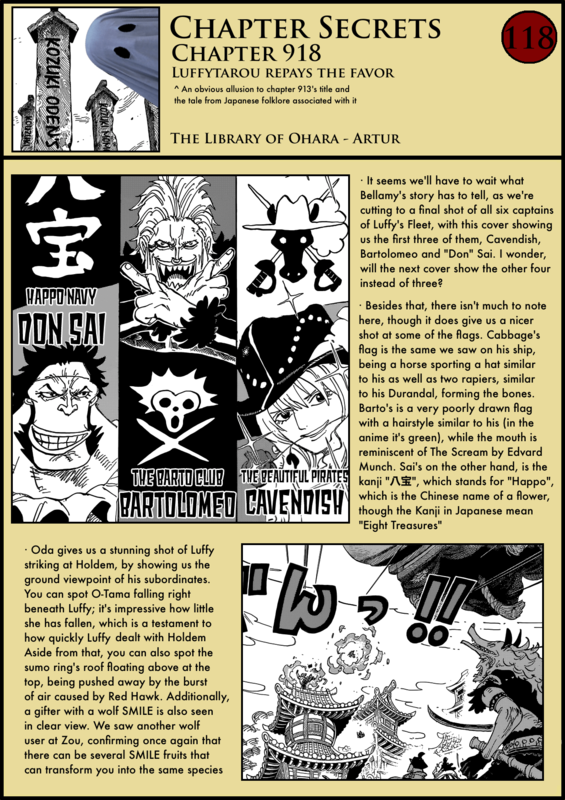 In case you haven’t read it, I’ve posted a very important update for the Library of Ohara, so please give it a look! Great Analysis! I was thinking, maybe all of the Kouzuki family and retainers were killed 20 years ago, but their pet dragon managed to escape. With Kirin and Shisa walking around, why not dragons? And of any of these mythical creatures, a dragon would be most likely to be a possession and symbol of royalty. 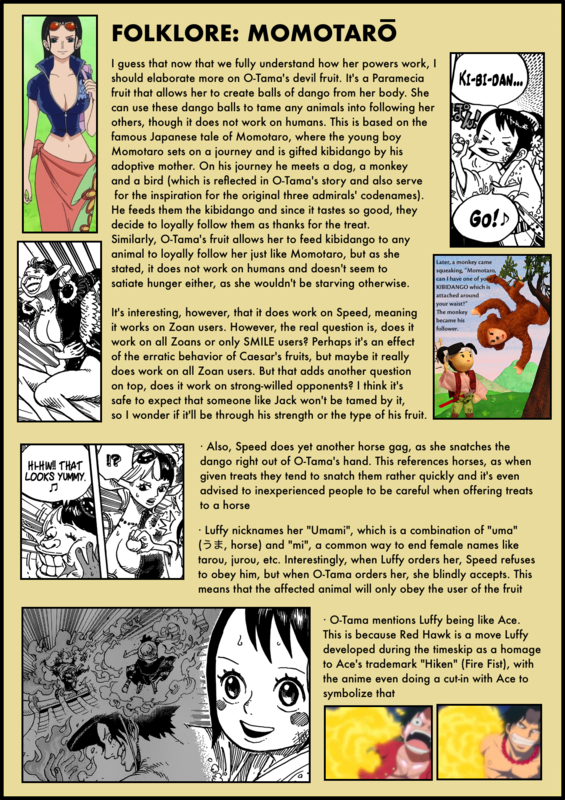 From my Wikipedia research, “The ancient Chinese self-identified as “the descendants of the dragon” because the Chinese dragon is an imagined reptile that represents evolution from the ancestors and qi energy.” Since Momonosuke’s dragon form resembles the eastern dragon, I went with this information (I know Wano is based off Japan, not China). 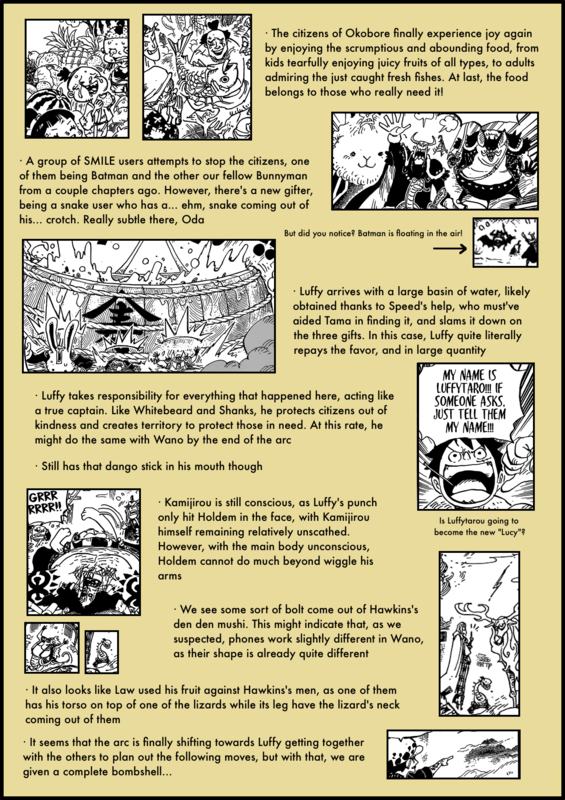 So either the pet dragon naturally had the ability to contact/manifest its ancestors, or maybe the dragon fled to Punk Hazard by chance after 20 years away from Wano and consumed the incomplete man-made devil fruit, which could have given the dragon the ability to take on the form of members of the Kouzuki clan or manifest representations of them. ORRRRRR they could all just be actual ghosts. Who knows? Regarding the over 20 years thing, I’m thinking that Oden was just dethroned and not killed 20 years ago due to him leaving Wano country. It could be that over 20 years ago, he returned from his voyage with Roger just after Roger was executed and wasn’t welcomed back to the throne due to him being involved in piracy. Great analysis as always, thank you for the hard work! My first thought was that the explanation for the time difference is simply that time moves more slowly (or is it more quickly?) on Wano. 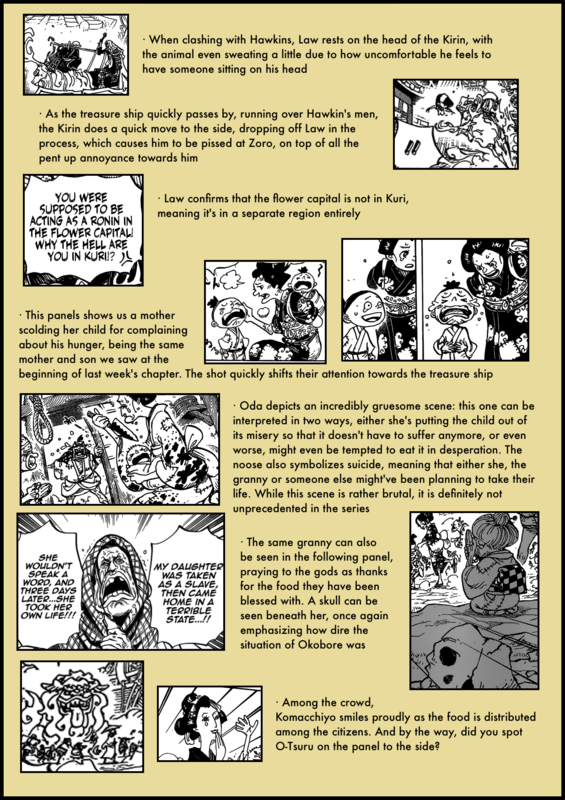 Meaning that while 20 years passed in Wano, only a few months passed outside of it. As islands in the New World have their own laws of nature (different climate etc) I don’t think it would be too far fetched to have an island with a unique passage of time (which could in turn also factor into why they are not part of the world government and so secluded). What are y’alls thoughts? That sounds very possible. As you said the islands in the New World each have their own wacky gimmick so something that affects the passage of time doesn’t sound to far fetched. Saw a comment on Reddit about kaw vs Hawkins that was not brought up. 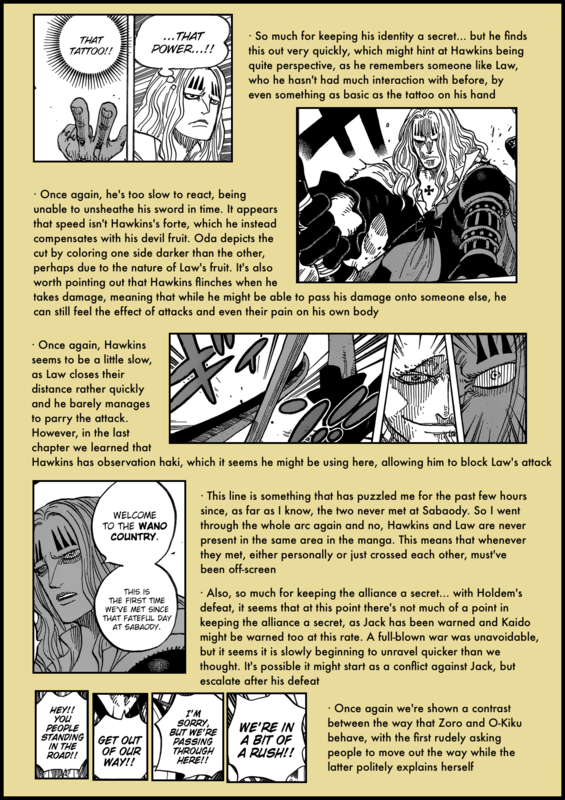 Law took out all of Hawkins’ henchmen in order to circumvent his ability thus forcing Hawkins to parry Law’s second strike. As expected your analysis is top notch. Good job and happy birthday artur. Heard it from brago d ace. Things like this are what make me wish you did the “chapter secrets” on older chapters. I would love to hear your thoughts on that panel in Dressrosa (Ch. 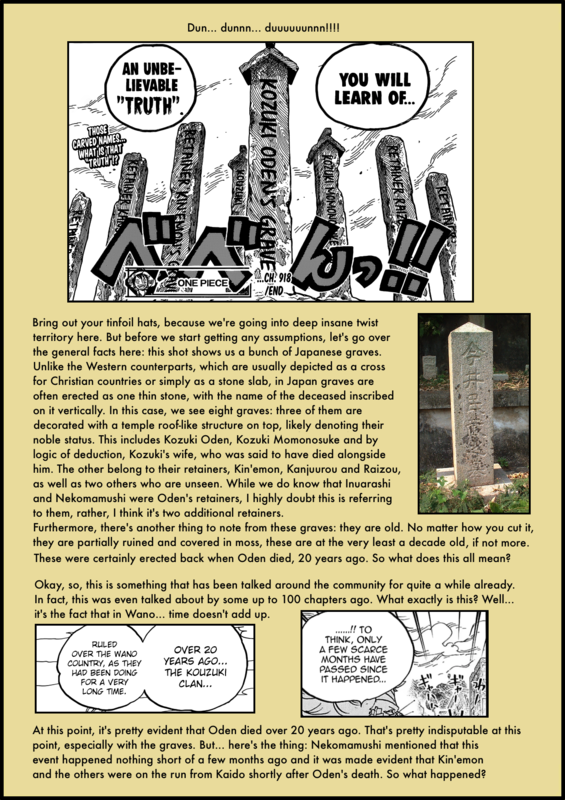 701) where Momonosuke remembers flying, and some kind of weird entity reached out to him. 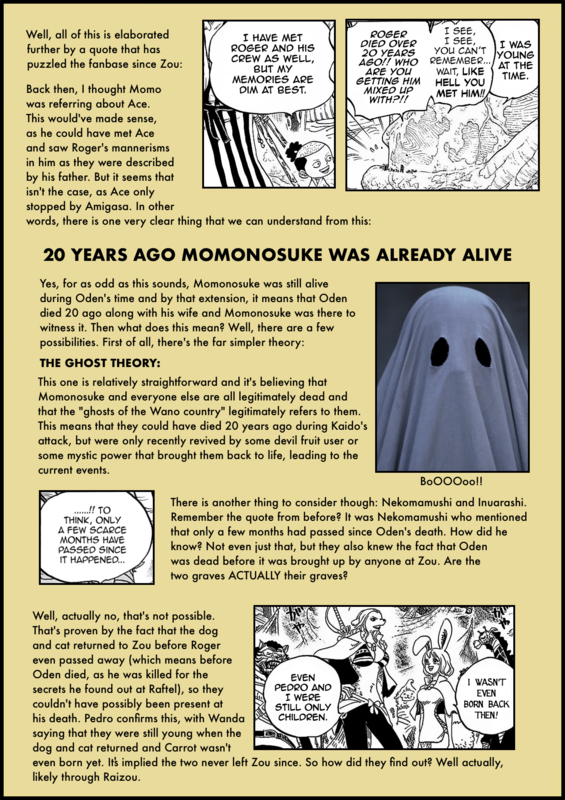 It was while he was in dragon form obviously, so this occurred during his time on Punk Hazard – which in turn means this was wayyy before we know who Momo really was. Your analysis is always helpful in seeing things I might not have noticed otherwise, and it’s nice to hear new perspectives always. Thanks for an amazing analysis as always! Holy sh!t snacks, take my eternal gratitude. 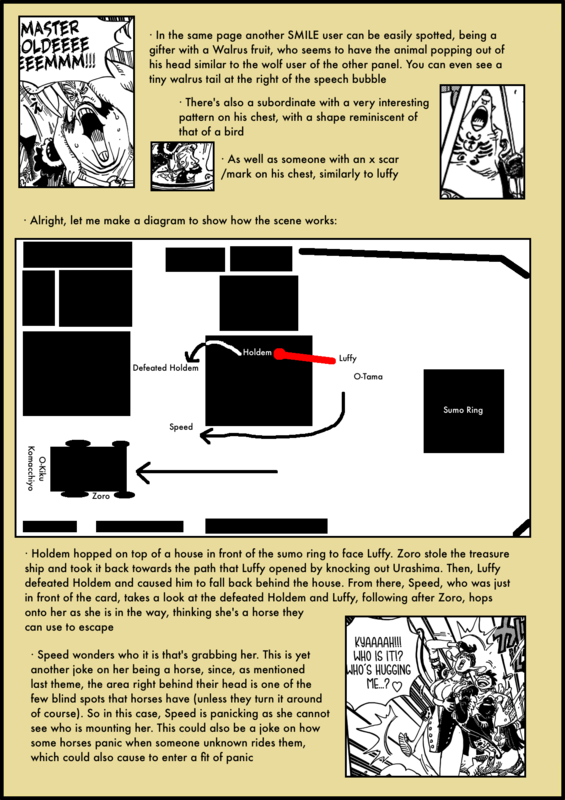 Time travel is a bit far-fetched, but it’d be very One Piece like, if time flows slower in Wano compared to the rest of the world. And Happy Birthday! Oh it’s TB arc then. On TB they get into Moria’s ship and seems hard to get in or out. Similiar to Wano. 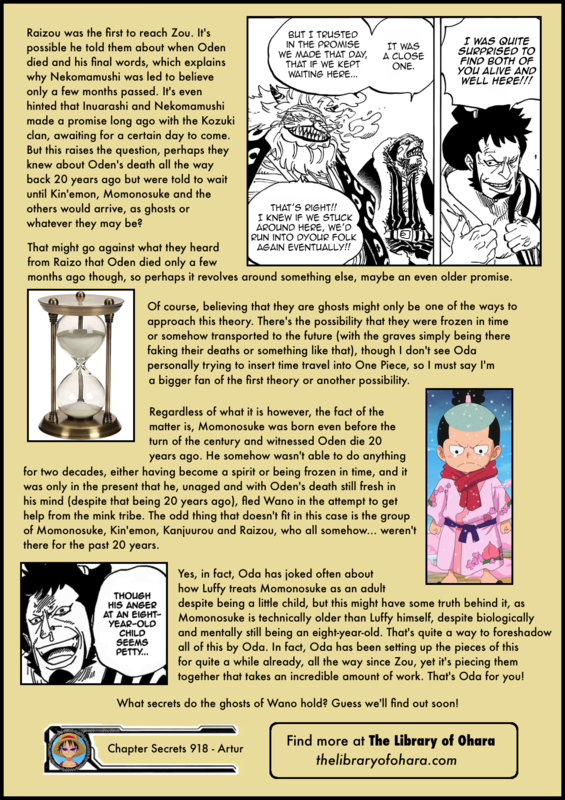 All we have to wait now is that Luffy gonna push a ghost back into the grave! Btw i read you post for a while now so i think it’s time to comment on how great your work here. Thank you and good job dear sir. Hope you can keep doing it. can somebody plz tell me in which chapter can I find the panel where the man is crying remembering his daughter who was taken as a slave?